Some of the following "comments" have been edited, usually to shorten their length. I owe you an apology! Many months ago I bought your CD. But I could not import any of the GEDCOMs into my program, "Family Tree Maker" I had bought the program especially for that purpose. Until then I had not used a computer program because I prefer seeing the entire file, not one screen at a time. I make my charts with Word Perfect. Hi Yvon: Your CD arrived over a month ago now. It was extremely useful and, except for one "dead end" in the GAUDET line (which I resolved through the Internet), it enabled me to trace ALL my Acadian (and even my one Canadian line: PERRON) back to France. I am thrilled! As you yourself said, the SEARCH system is a bit awkward. However, in spite of that, I was able to complete all the lines with a few missing details. Also I loved the "library" of shareware and the bibliography. Congratulations on a job well done. I have recommended the CD to several. Thanks for the interest and the CD. It was surely worth the $49. Once I get my GEDCOM complete (perhaps in a year), I'll be happy to share a copy with you. 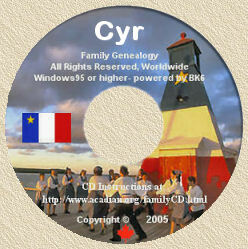 Yvon: I must tell you that I am STILL using and consulting your "In Search of Our Acadian Roots" CD-ROM and have found every single one of my Acadian-Canadian ancestors on this CD, even those in "La Beauce" and other non-Acadian parts. I have not completed all the lines to France, but I'm almost there, mostly thanks to your CD, with a little help from the Mormons and a contact I got from the Internet. That help was simply to make the connections. Actually, ALL the names from the mid 19th century back, are there on your CD. Thanks so much. I'm looking forward to participating in your second Acadian CD, if it ever comes off. Keep up the good work. Sincerely, Fr. MacDonough. Dear Yvon; I received the CD-ROM and thanks to your work in putting together the information available on the CD, I was able to trace one line on my Wife's side of the family, (Kirouac line) back to 1644 and was able to find 6 generations back for her. This took it back to France. I was also able to find the information I had been searching for approx. 2 years on the Thibodeau line of my Great Grand-Mother and was able to located the information I needed to tie it together and more. The Thibodeau line took me back to Pierre Thibodeau as I had believed it would and the CD confirmed it. I was also able to tie in the Cyr line. Knowing that my Great Great Grand-Mother was Marie Cyr who was married to Olivier Thibodeau, I found where Marie was the daughter of Jean Sire (Cyr) and was able to go back again to the very beginning of the first Sire. So, I guess we are very distantly related. It has been very exciting it working with the CD and the tons of information it gave me to finish my 2 year project. I will be sending to you in the very near future a finished copy of my GEDCOM file and also one of my wife's line. Again, I can't thank you enough for the work you have done in putting the CD together. The CD is very well worth it's weight in gold for what it can offer to those out there looking for information on their Arcadia/Canadian Roots. PS: The GEDCOMS I found my information on was on the D-Warre1 file and then of course, what information I gathered from that one, I found additional information that matched against your file and my wife's file matched against the R-Burton file. Yvon: I hope all is going well for you. After reading the samples of your "In Search of Our Acadian Roots" CD-ROM on the Internet, I'm excited already! Enclosed is my check for your CD, which my instincts tell me, will probably be the wisest $49.00 I have ever spent! I sincerely hope that those who purchase your CD, not just extract information, but realize what a "Labour of Love" producing this CD was. Through your "moral leadership" and those you have inspired to aid in this project, others might learn to not just perform genealogical research on a personal basis, but focus also on helping others with a heart as big as yours. A day later I got a message from a Remi Ferland, who teaches literature at Laval University. He also does genealogical work on his family, and went to the office at the university that holds their Quebec archives. In the census index there he immediately found some data (knowing Octave's son's name served as a check that these were the people I needed to find) and sent it to me - the names of Octave's and Jules' parents and grandparents. Then a week ago Monday, Remi sent another message. This one included two more generations back, including a Michel Bergeron and wife Madeleine Bourg. I had a feeling I had seen their names before, so I checked some of the family trees I had derived from your Acadian CD-ROM that I had bought. It turned out that Michel was the grandson of Barthelemy Bergeron dit D'Amboise (who was the one that came from France), and that the ancestral data went back an additional 5 generations - all the way to a person born in 1515! When I made the connection I let out such a whoop of joy, I'm sure my co-workers thought I was crazy. Thank you for all you went through which allows us to have such a massive amount of data. Between your CD-ROM and a copy of Adrien Bergeron's (a distant cousin of mine, it seems) "Le grand arrangement..." which I hope to get soon, I should be able to trace back all of my Acadian heritage. The Internet and your product made this possible. Yvon: Let me tell you that your Home Page on Acadian is wonderful, well made. Congratulations. The whole project that you have dreamed of and brought to an end is extraordinary. In French we say "Je lève mon chapeau" for this marvelous success. I would like to participate in this huge project of yours, but I just discovered about it last week, having joined the Internet only a month or so ago. I will take a moment to wish you a prompt recovery following your surgery on June 26th 1995, and I know you will, due to your strong moral detected in your writing. Bonne chance. Hubert Potvin. Yvon's CD arrived today. It will take a while to evaluate it. It's a monster. Unexpected bonus, it contains lots of shareware software. Yvon's CD is definitely not the same as that sold by GPC (GPC still not arrived). GPC-CD will come with the user friendly GRS support software. Yvon's software is not GRS, nor user friendly. In defense of Yvon, I was not expecting support software at time of order, so what is there is a bonus. If you don't mind creating a subset GEDCOM for every search, Yvon's software is nice, indeed. Mike. PS: Yvon should be in surgery today, let's all pray for him. "J'ai reçu moi aussi le CD-ROM et j'ai resumé le contenu dans FM- Genealogie et les autres groupes qui y sont connectés. Beau travail, bravo! J'en ai parlé a certains généalogistes et je suis sur que tu vas recevoir d'autres commandes de CD-ROM de la région de Montreal. Denis." Thank you Yvon, my copy has also arrived in Quebec City, and I have started using it with the group of students who have been researching their family histories after school... the real plus for me was the .MAT files; I could have spent years doing that, by the "look until you find it" method (otherwise known as a Columbus search!) I hope your surgical days will end with little pain or added delay. Good luck and thank you. Gordon Pierce.